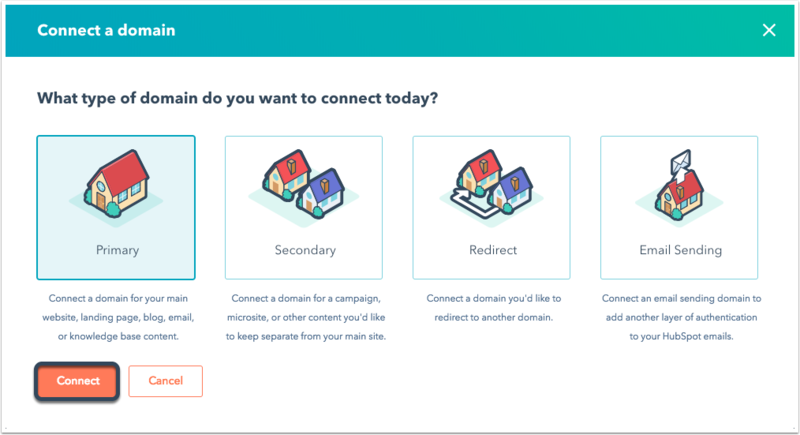 Connect your domain to HubSpot and edit your DNS records to take your content live. Please note: to connect a domain to HubSpot, your domain's nameserver host must have the ability to point a CNAME record to HubSpot and set up a 301 redirect from the non-www version of your domain to the www version. If your DNS provider does not provide a 301 redirect, reach out to HubSpot Support for further assistance. What does it mean to take my content live with HubSpot? 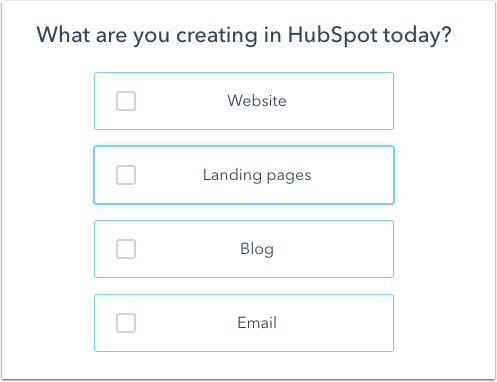 Taking your content live with HubSpot means associating the content in your HubSpot account - your landing pages, website pages, email, and blog posts - with your website domain. For example, if your website is www.hubspot.com, you can take your content live so it can be accessed by visitors on the web at that web address. Follow the instructions below to connect a new domain in HubSpot. You can also follow these steps to review your DNS setup and troubleshoot a disconnected domain with your provider. Start the process by connecting your domain in your HubSpot domain manager and copying your CNAME. Primary: a subdomain used by default for hosting the selected content type(s) in HubSpot. Secondary: a subdomain available for hosting content in HubSpot, but not set as primary for any of your content types (Marketing Hub Enterprise only). Redirect: this subdomain isn't used to host any content, but automatically redirects to another primary domain connected in HubSpot. Email Sending: the subdomain you're connecting will be used to add another layer of authentication to your HubSpot emails. Learn more about how to connect an email sending domain. Select the checkbox next to the content type you will host on this domain. Please note: the Email content type is for the web version of your marketing emails. Learn how to connect an email sending domain to authenticate the From address used to send your marketing emails. In the dialog box, enter your domain. Subdomain: the subdomain is the first part of the domain name (e.g., www is the subdomain for www.mywebsite.com and landing is the subdomain for landing.mywebsite.com). You can customize this for business or marketing purposes. Brand domain: the brand domain is in between the subdomain and the top-level domain(e.g. mywebsite is the brand domain for www.mywebsite.com). If you are connecting a domain for the first time, this domain will be set as your account's brand domain. Top-level-domain: the top-level domain is the end of the domain that comes after the brand domain. For example, .com is the top-level domain for www.mywebsite.com. Now you are ready to set up your hosting with your DNS provider. If you use GoDaddy, click Update my CNAME. By clicking this call-to-action and logging in to your GoDaddy account, you're allowing HubSpot to access your GoDaddy account and automatically update your CNAME in your DNS records. If you are connecting your entire website to HubSpot, you'll still need to make some manual changes to your DNS records. First confirm that your content is ready to go live, then select the I am ready checkbox. Log in to your DNS provider. You'll need access to your DNS provider to update the CNAME record. If you don't have access or are unsure how to do this, share this page with your IT team or contact your DNS provider directly. Once you're logged in, select the I am logged in checkbox in HubSpot. In you DNS provider, update your DNS records for your domain. Under the Host (Name) column, locate the subdomain you are updating and copy the value under the Value column. Update the record type with this copied value in your DNS settings. Please note: if you're using Network Solutions or NameCheap for hosting, or adding your records to GoDaddy manually, these providers add your brand domain and top level domain to the end of these DNS record automatically. You only need to enter the subdomain in the host name field in your DNS settings. Once you update you DNS records, select the Done checkbox in HubSpot. Verify your DNS changes, then click Done. Before making any DNS changes, ensure that your nameservers are hosted with your current DNS provider. If you need help making changes to your nameservers, reach out to your IT department or to your DNS provider's support team. Also, it is recommended to take a screenshot of your DNS records with the original CNAME records for your files before making changes. Log in to your DNS account. Locate the existing CNAME record for the subdomain you're connecting or create a new one. Enter the prefix for your subdomain (www, info, blog, etc.) into the host, name, or alias field. Paste the CNAME record you copied from HubSpot, [your Hub ID].groupX.sites.hubspot.net, into the target or points to field. If you'll be hosting your entire website with HubSpot and your DNS provider supports forwarding, set up a redirect in your DNS settings so your non-www domain (such as hubspot.com) will forward to your www domain (such as www.hubspot.com). Root domains cannot be connected to HubSpot. You will need to redirect your root domain with your DNS provider. Use the instructions by provider linked below to set up the root domain redirect with your DNS provider before connecting your domain to HubSpot. If you're not sure who is hosting your domain, consult with your IT department or look up your domain. Please note: if you need additional assistance making changes to your DNS records, reach out to your DNS provider's support team. If you're using GoDaddy as your DNS provider and you've decided to edit your CNAME record manually, first ensure that your nameservers are hosted by GoDaddy. Then log in to your GoDaddy account and locate and edit the existing CNAME record for your subdomain or create a new one. In the Points to field, replace @ with the CNAME record that you copied from HubSpot. Click Save. If you are hosting your entire website with HubSpot, you'll need to set up forwarding in GoDaddy to redirect your root domain (e.g. mydomain.com) to your www subdomain (e.g. www.mydomain.com). When you're finished updating your DNS records, wait for domain provisioning to complete. In the blank Alias field in your Network Solutions account, enter the prefix of the subdomain that you want to connect to HubSpot. Click the Other Host radio select button. Paste the CNAME address that you copied from your HubSpot account into the Other Host field and click Continue. Click Edit A Records on the Domain Names screen under the My Products and Services tab. For the @ none, enter the following IP address: 205.178.189.129. Delete the records for the WWW and *(All others). The WWW and the * record will still appear in the A Records, but will have none next to them. Select Continue and Save Changes. In the Host Records section of eNom, below your existing records, there's a blank entry for adding new records. In the blank Host field, enter the prefix of the subdomain that you would like to connect to HubSpot. Change the record type dropdown menu from A (Address) to CNAME (Alias). Paste the CNAME record that you copied from your HubSpot account into the Address field and click Save. If you're hosting your entire website with HubSpot, you'll need to set up forwarding in eNom to redirect your root domain (e.g. mydomain.com) to your www subdomain (e.g. www.mydomain.com). Scroll to the A/AAAA and CNAME Records section of your subdomain's DNS settings. Select the radio button for CNAME. In the Alias field, paste your CNAME value. Be sure to click the checkbox below the Alias field and click Save to save the CNAME record. If you're hosting your entire website with HubSpot, you'll need to set up forwarding in 1and1 to redirect your root domain (e.g. mydomain.com) to your www subdomain (e.g. www.mydomain.com) by following these instructions. Please note: with 1and1, the redirect that you can set up from the root domain (domain.com) to the subdomain (www.domain.com) can only be set up as a 302 redirect. This redirect is also not a wildcard. A 301 wildcard redirect is the best method to implement a permanent redirect. In the Managed DNS section of your DNS Made Easy account, add the www (or other subdomain) CNAME record by clicking on the plus sign under the CNAME Records section. To edit a current subdomain's CNAME record, place a check mark next to the record and click on the pencil icon. Type www (or blog, info, etc.) into the Name field and then paste the HubSpot CNAME value into the Alias to field. Add a period to the end of the CNAME value and then click Submit. If you're hosting your entire website with HubSpot, you'll need to set up forwarding in DNS Made Easy to redirect your root domain (e.g. mydomain.com) to your www subdomain (e.g. www.mydomain.com). Navigate to your cpanel in Bluehost. Scroll down to the Domain management section and click on DNS Zone Editor. If you see the record you'd like to use in the A-Host section, delete it. Add in a CNAME record or edit your existing CNAME record by pointing it to HubSpot's CNAME address. If you're hosting your entire website with HubSpot, you'll need to set up forwarding in Bluehost to redirect your root domain (e.g. mydomain.com) to your www subdomain (e.g. www.mydomain.com). Please note: if you need further assistance setting up the wildcard redirect for forwarding in Bluehost, you'll need to either set up the redirect yourself by editing the .htaccess file, or contact Bluehost support to have them set up the 301 redirect for you. After logging in to your Namecheap account, find the Host Records section of your Advanced DNS section. Click Add new record and select CNAME Record from the dropdown menu. In the Host field for your new record, enter the prefix of the subdomain that you would like to connect to HubSpot. Then paste your CNAME record into the Target field and select the checkmark towards the right to save. If you're hosting your entire website with HubSpot, you'll need to set up forwarding in Namecheap to redirect your root domain (e.g. mydomain.com) to your www subdomain (e.g. www.mydomain.com). Log in to your iPage account and navigate to Edit Domains. Enter the DNS records for your domain. Add or edit your CName record using iPage's instructions. If you're hosting your entire website with HubSpot, you'll need to set up forwarding in iPage to redirect your root domain (e.g. mydomain.com) to your www subdomain (e.g. www.mydomain.com). Log in to your Register.com account to manage your domains. Locate the Advanced Technical Settings section and click Edit Domain Aliases Records next to CNAME. Add a new CNAME record for www (or, if you're only adding a subdomain, add in the appropriate subdomain here such as info. or blog.) and then add the CNAME record you copied into the text box after points to. Click Continue, then Continue again to confirm your changes. If you're hosting your entire website with HubSpot, you'll need to set up forwarding in Register.com to redirect your root domain (e.g. mydomain.com) to your www subdomain (e.g. www.mydomain.com). You can use this link to log into your Register.com account and set up forwarding. Once your domain provisioning is complete, SSL will be enabled automatically. This usually takes about 10 minutes, but can take up to 24 hours. Standard SSL is enabled free for Marketing Hub Basic, Professional, and Enterprise customers. If you're interested in purchasing dedicated SSL or custom third-party certificates you can contact your Customer Success Manager. You are still a HubSpot customer. You still have your domain CNAME pointed to the secure server which was set up in the initial process. If you're using a custom certificate, a HubSpot team member will reach out 14-30 days ahead of time to discuss renewal and any necessary technical steps. Please note: DigiCert is the certificate authority that provisions a certificate for your domain. If your domain has a Certification Authority Authorization (CAA) record, ensure digicert.com is listed so SSL can be provisioned or renewed. In the left sidebar menu, select Domains & URLs. Click Edit to the right of your newly connected domain. In the dropdown menu, select the Require HTTPS checkbox. Please note: after SSL is enabled, content loaded over http (such as images and stylesheets) will not load on your site. Content loading over http on an https site is referred to as mixed content. 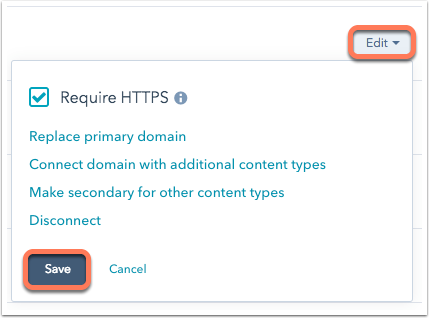 If you are looking to set up a reverse proxy on HubSpot, note that setting up the HubSpot CMS with a SSL reverse proxy is not supported or recommended as it can compromise performance and security. If you are preparing to host your HubSpot site using SSL (HTTPS), you might want to test it locally to make sure it will resolve. However, trying to test the secure CNAME by creating an entry in your hosts file will fail because there is a dependency on the authoritative DNS chain being accurate. Can I use my existing SSL certificate with HubSpot? Using a pre-existing certificate may compromise the security of that certificate, so HubSpot does not allow this. If you purchase HubSpot's Custom SSL Service, you can use a third-party certificate and that certificate must be paired using a certificate signing request (CSR) generated from HubSpot's server. In step 1 of the Verify URLs stage, click Click here. In the dialog box, click Send verification email. This will prompt an email to the email address registered with the domain, as stored with who.is. Check your spam and junk folder for an email from <support@certvalidate.cloudflare.com>. Check the email address registered to your domain. Ensure you are checking this email's inbox. Add your email address to who.is. If you check your spam and junk folder and are not able to add your email to who.is, contact HubSpot Support to discuss additional options.